Since around 2000, most high-performance computing (HPC) systems have been set up as clusters based on commodity x86 hardware. These clusters consist of one- or two-socket servers to perform the actual computations, plus storage systems and administrative nodes. Modern Intel® Xeon® processor-based systems, as well as the Linux* kernel, provide many ways to optimize both hardware and operating system (OS) for a specific application. It’s easy to do if your cluster is only used for a specific workflow―but for more complex usages, it’s beyond the ability of most cluster managers. There is a way to perform complex optimizations on a per-job basis. Intel tested this idea in its benchmarking data center, which has approximately 500 compute nodes. The cluster, known as Endeavor, is rebuilt on a regular basis with the latest hardware and has been listed among the TOP500 SuperComputer Sites since 2006. Figure 1 shows the layout of Endeavor. 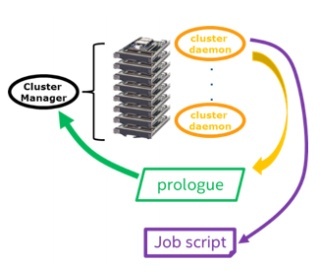 Users typically connect to one of several login nodes, package up their workloads in the form of job scripts, and submit those jobs to a cluster manager. The cluster manager (e.g., Altair PBS Pro*, Bright Cluster Manager*, IBM LSF*, or Slurm*) is a scheduling tool trying to allocate the cluster resources as efficiently as possible. 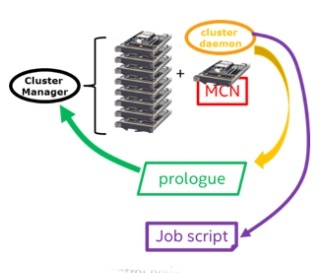 For the cluster manager, each job is simply a request to use X compute nodes for a Y amount of time. When a user submits a job, the system checks to see if all necessary parameters are within sensible limits, and then waits until enough resources of the required type become free (Figure 2). Once the cluster manager can assign enough nodes, it runs a special program called the prologue (Figure 3). This program is usually executed on the first node (also called the headnode) assigned to the job. The purpose of the prologue varies, but it might be used to check that all nodes assigned to a job are in good health. Once the prologue successfully completes, the cluster manager starts the actual job on the nodes. In most cases, this is a shell script executed on the headnode. Once this script terminates in any way, the cluster manager cleans up the nodes, running an epilogue program and preparing the nodes for the next job. The Intel® Xeon Phi™ processor is equipped with fast on-socket MCDRAM memory, usable either as a standard memory block or as a fourth-level cache. Using it as a cache will speed up programs automatically, but using it as standard memory might be even faster. Switching between those modes requires changing a BIOS option and rebooting the system. The Intel® Xeon® processor uses a mesh to communicate among the cores, cache, memory, and the PCIe controller. The BIOS Option Sub Numa Cluster allows a user to reconfigure the CPU and split it into virtual sockets. Modern Linux* kernels know the concept of NO_HZ cores. Normally, cores are interrupted every 100 to 1,000 ms to do kernel work and task switching. For typical HPC workloads, this behavior is counter-productive. With the NO_HZ parameter, one can configure the kernel to schedule only one interrupt per second. This decreases OS noise, increases scalability, and can improve performance but requires kernel changes and a system reboot. With the standard approach of prologue scripts, the requirement of a reboot leads to a dilemma. The moment the headnode reboots, the cluster manager will assume the prologue has terminated, stop preprocessing of the job, and then reschedule it. A new set of nodes will be allocated for the job, a new headnode will be selected, and the prologue will execute―with exactly the same results. Intel’s HPC benchmarking cluster, Endeavor, currently uses IBM LSF*. The only simple and portable solution we could find was to add a master control node (MCN) to each job (Figure 4). This MCN would automatically become the headnode of a job. It would execute the prologue, use syscfg to make any changes to the BIOS configuration, and reboot the compute nodes using the Intelligent Platform Management Interface (IPMI). It would then wait for the nodes to come back up, check that everything is correct, and finish the prologue. If the prologue completes successfully, the job will start. Login to the first node in the nodelist, then continue to work as usual. Use an option in modern MPI versions to exclude the headnode from the list of nodes used for job processing. Typically, the headnode of an MPI program has to start up additional processes―for example, an ssh process for every MPI process in the program. Since this additional load remains on the MCN, all compute nodes will have an identical system load. Specific to Intel Xeon Phi processor-based clusters, if the MCN is a standard Intel Xeon processor-based server, startup scripts and MPI initialization will process faster than on an Intel Xeon Phi processor-based system. On Endeavor, the prologue and epilogue not only check node health. The system also allows users to change parameters requiring root privileges. Since most of the code for the prologue and epilogue is identical, we use the same script in both cases, switching codepaths when necessary. We wanted to stay close to standard LSF syntax, so we wrote a small wrapper script around bsub, extending the command with a -l option. All special requests are translated into unique environment variables, since LSF transfers the environment of the user not only into the job, but also to the prologue and epilogue. The user requests two nodes of the type ekf. The script sets the corresponding environment variable. The selection string is expanded to include the control node type. With those two changes, the original LSF binary (renamed bsub.orig) is called. To reboot nodes via the network, we use the IPMI. PXE is already used in most clusters. For reconfiguration purposes, we made use of the way the pxelinux.0 binary queries the tftp server for boot configuration files (Figure 5). 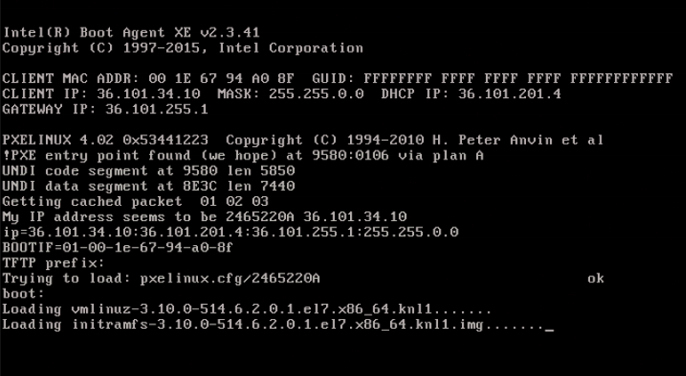 The first query is for a file named after the MAC address (01-00-1e-67-94-a0-8f). The second query is for a file named after the IP address assigned by the DHCP server coded in hexadecimal (2465220A). We use the second query for default boots and can therefore―temporarily―create a suitable file of the first type to override boot configurations for a specific job. For this to work, we depend on a systematic PXE configuration. For each node a link nodename points to its IP address coded in hexadecimal. This second file is again a link pointing to the default configuration. Each represents a boot configuration. In this case, k229 and k514 indicate different kernel versions, sp1,2,3... all have special kernel options (e.g., NOHZ_full). If the user requests a specific configuration, the corresponding file for this node has to be present. So, in our example, the node emhtest329 could be rebooted into the configuration k515sp2 because the file ol7u3_sda6-k514sp2 is present. But asking for k514x5 would fail. Intel provides the syscfg utility for Intel-manufactured motherboards, which allows reading and modifying BIOS parameters from Linux. Not all OEMs provide similar tools. The integration into LSF is now straightforward. The prologue is automatically executed by LSF on the master control node. Early in the prologue, before any other checking or setup is done, the reconfiguration script needs to be executed on all compute nodes of the job (not on the control node itself). If a node declares that a reboot is needed, the prologue can use IPMI to reset it. It then waits until the reboot is complete. A maximum wait time ensures that nodes failing to boot will not wreck this scheme. During epilogue, the similar jobflow reestablishes node settings to their default values and, if necessary, reboots the nodes. into its associated numerical value. It requires the variable $I to be set correctly. After a job completes, the epilogue should run on all nodes. Check current values for BIOS options against expected values in $SAFEDIR/syscfg.INI and correct any differences. If there are any differences, set the variable $REBOOT=yes. Our kernel command lines contain a hint to whether the node is running the default kernel or anything special in need of a reboot. The script ends, producing an output of either “REBOOT=yes” or “REBOOT=no”. The prologue script running on the control node will parse the output and, depending on this output, issue a reboot sequence via IPMI. 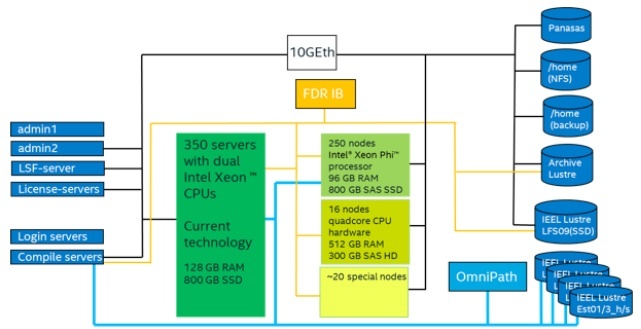 Modern Intel Xeon processor-based systems, as well as the Linux kernel, provide many options for optimizing the hardware and OS for a specific application. We’ve outlined a way to perform complex optimizations on a per-job basis. There’s a price to pay in the form of added complexity and job startup times, but for Intel’s HPC benchmarking cluster, Endeavor, this feature became a very important way to boost performance over the last year. Your gains might be even higher.